Welcome to the UQ Seismological Observatory Website. 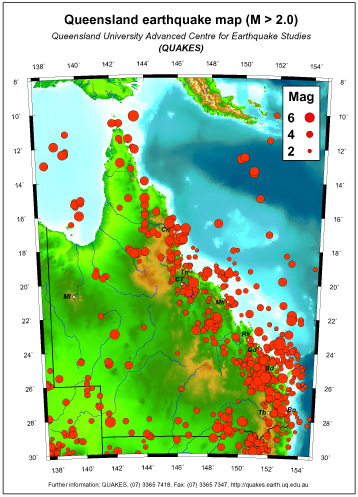 The UQ Seismological Observatory operates a network of seismographs in South East Queensland, Australia. The seismographs are used to detect local and distant earthquakes, mine blasts and other signals including vehicles, machinery and the movements of local wildlife. Since June 2004, all of the seismographical data has been stored in an online database. Follow the links below to find out more about earthquakes in Queensland and the UQ Seismograph Network, or view seismograms and heliplots recorded by UQ.